All 5 Democrats running in the primary to replace now-Senator Ed Markey in the House of Representatives have agreed to participate in our Open Debate, where the public submits and votes on the questions. This is also Sen. Elizabeth Warren's home congressional district. Open Debates will be a game changer in our political process -- ensuring that questions get asked that the public actually cares about. What starts in Massachusetts will hopefully become the norm for local, state, congressional, and even presidential debates in the future. While this debate is a first, the idea of Open Debates is not new. During the 2008 presidential campaign, I was happy to work with Internet guru (now Harvard Professor) Lawrence Lessig to lead an amazing alliance of progressives, conservatives, and techies who came together around the Open Debate Coalition. This coalition included MoveOn, DailyKos, Arianna Huffington, Grover Norquist, Newt Gingrich's American Solutions, RedState, Craig from Craiglist, Jimmy Wales from Wikipedia, the Electronic Frontier Foundation, the Personal Democracy Forum, Aaron Swartz, and many others. 1. Debates are for the benefit of the public. Therefore, the right to speak about the debates ought to be "owned" by the public, not controlled by the media. [M]edia companies [should] release rights to presidential debate video to ensure that key moments can be legally blogged about, shared on YouTube, or otherwise shared without fear of legal repercussion. 2. "Town hall" Internet questions should be chosen by the people, not solely by the media...YouTube debates were a milestone for Internet participation in presidential debates. But they put too much discretion in the hands of gatekeepers. Many of the questions chosen by TV producers were considered gimmicky and not hard-hitting enough, and never would have bubbled up on their own. This "bubble up" idea is the essence of the Internet as we know it. The best ideas rise to the top, and the wisdom of crowds prevails. The McCain and Obama campaigns both endorsed our open debate principles. Unfortunately, it was sufficiently late in the process that the Commission On Presidential Debates went forward with their debates as planned. This prompted calls from across the ideological spectrum for the old-school, top-down commission to be abolished. But now... Open Debates are back! 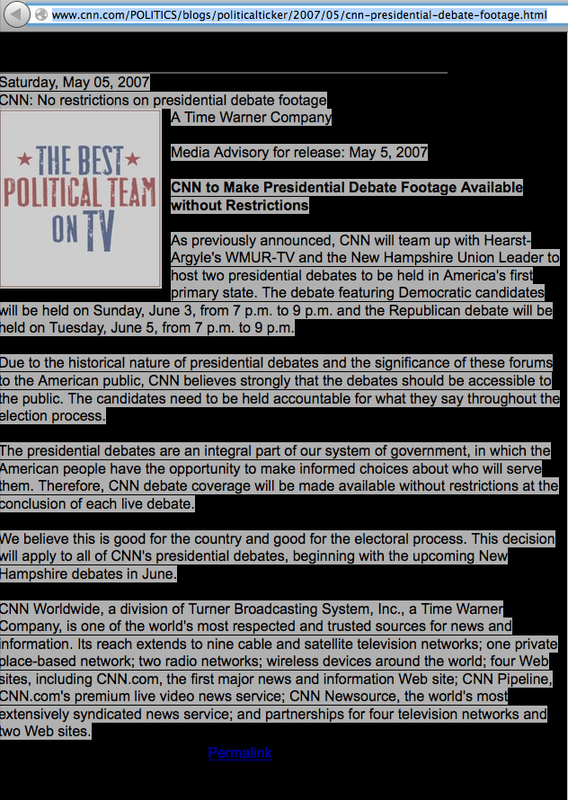 Poised by the important precedent of a Democratic and Republican presidential campaign backing Open Debate principles, we now will form a new precedent: Actually pulling off the first Open Debate. Massachusetts has the honors, and the nation will be watching as Will Brownsberger, Katherine Clark, Peter Koutoujian, Carl Sciortino, and Karen Spilka debate.